new & improved as we’re going to get: a kinder shade of the other white meat? Do you have any pig friends? If not, you probably don’t know so I’ll let you in on a secret: pigs are like roller coasters, pogo sticks and trampolines. I’m not kidding. It’s just not physically possible to hang out with free-to-be pigs and not laugh. Pigs are clean, smart, happy, silly clowns; get to know them in person and you’ll realize just how unkind it is to keep them in confinement. Recently, Nicolette Hahn Niman of Righteous Porkchop and BN Ranch fame shared this video of a modern, improved Confinement Pig Operation and the contrast between the pigs in the video and my own pigs was something I pondered for several days. Please take a minute to watch this. It’s short, informative and there’s nothing that will spoil your breakfast – I’d never trick you that way. The commercial pork industry is busy posting videos like this to reassure those of us who expressed and acted upon our disapproval of confinement farming methods. It’s a significant first step and I want to be sure to appreciate it, but of course I have some questions and observations too. I was pleased to see the sows in group pens, and they seem to be peaceable – pigs are picky about the company they keep and don’t tolerate annoying room-mates particularly in close quarters. And you’ll see, quarters are close. How does one manage this many genetically similar animals in confinement this close without medications? How does one dispose of the waste produced in a safe, holistic way that enhances the land? And, how does one birth piglets in a way that is safe for the babies and humane for the mothers? The video avoids carefully skirts explaining their use farrowing crates – stalls so tiny sows are prevented from turning around. I picked up on something about 7 days – anything can be endured for a mere 7 days, right? Okay, that’s snarky. To be fair, one of the nasty bits about raising pigs is birthing piglets, and farrowing crates, even industrial style ones do serve a valuable purpose. In nature, piglets can have a pretty high mortality rate and in an industrial setting where the mothers are stressed, crowded, and have diminished maternal instincts, the mortality is amplified. Piglets can be in danger of accidental squashing or intentional aggression from their mothers and need some sort of safety measure, hence farrowing crates. You know what else you’ll see in the video? These pigs have no bedding and I don’t see any rooting or playing. Contrary to their reputation, pigs have clean housekeeping habits. Pigs keep themselves, their bedding and feeding area clean. Bedding (I use a combination of sawdust and spelt straw) is very, very important to pigs. To be fair, there are synthetic animal flooring products available that provide a cushiony surface without traditional bedding and hopefully that’s what these girls are spending their days standing and laying on, though it doesn’t look very comfy or soft. Many pigs do spend their lives on nothing but concrete; hard on their legs & hooves, unforgiving and cold to lie on and offers no absorption of urine and feces, forcing pigs to lie in their own waste which is not natural for them at all. This operation is clearly digital state of the art, and bedding is not something they are likely to overlook as it is tremendously important to the pigs quality of life and health, but it’s not commented on, and I don’t see any – what should we think? Assuming it’s being used, modern synthetic bedding products are designed for the convenience of the operator, not the contentment of the animals. It’s easier to hose things off than it is to shovel manure the old-fashioned way. Concrete, metal and synthetics can be sanitized in a laboratory-style way. The cozy, comforting all-natural stuff creates good compost, managed properly keeps animals clean, dry and warm and shoveling manure doesn’t waste any water. Nature has her own means of sanitizing, dependent on fresh air, appropriate population size, sunshine, abundant bedding material and manual labor, all rare commodities in a confined animal feeding operation (CAFO). Not to mention that man-made bedding doesn’t smell like anything pigs enjoy; there’s nothing they like more than pushing those rubbery noses around in things that smell like nature. If you want to see pure joy, throw my pigs a fresh, clean bale of straw or a load of fresh grass and stand back. Very, very entertaining. Or watch one race around carrying a bucket or some other found treasure, the others scrambling & barking, in hot chase… just like dogs with a ball. 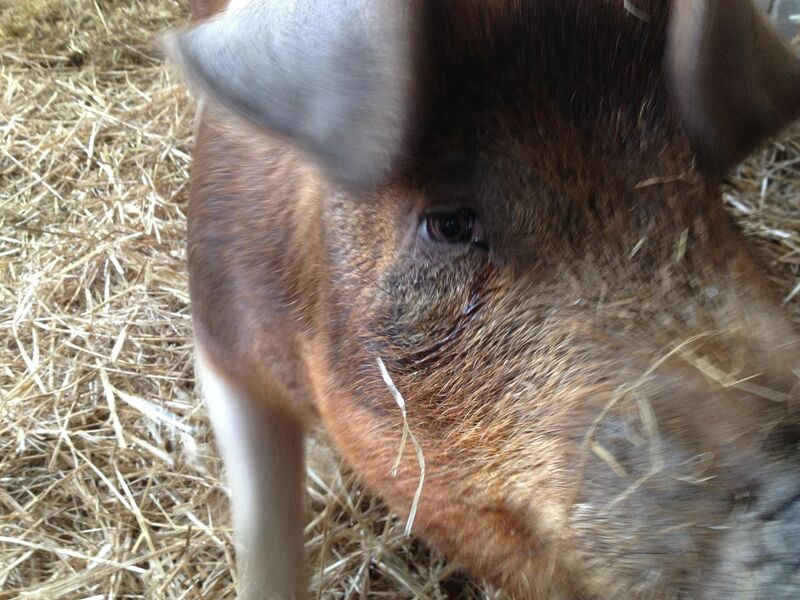 Something else you won’t learn from this video is how talkative and playful pigs are. The girls in the video seem pretty lethargic, but to be fair, it’s natural that as sows get older they will grow less playful, so I’ll assume that’s some part of what’s happening in this video. My pigs are curious and active. Their chirps, barks, squeals and satisfied humming crack me up every day – all missing in this video. Pigs love to know what’s going on and have a wide and full vocabulary, punctuated with plenty of tail wagging & slapping. There’s no way I could film a video like this and not have pigs worming their way into the action: these girls don’t seem to care about much. Don’t let me be cynical and ungrateful though. This is a huge first step for the confinement pork industry, and I greatly appreciate it. But, as I see it, it is a first step. It is important that we not assume the goal of better lives for factory-raised pigs has been achieved. As consumers we need to remain vigilant and vocal; commercial producers will revert to their previous cheaper, more convenient business as usual if and when we turn our attention elsewhere. Semantics matter: System or Farm? You know what else? The number of times the speaker used the word “system” is kind of distracting – but fitting too. To be more precise with the words, he’s more an “operator” or “manager” than a “farmer”. He has a “facility” or “operation” instead of a farm and so many pigs he needs a computer monitoring system to tell him if a pig is off her feed. Things are a little less sophisticated around here. My system? I ask the pigs and they tell me all I need to know. Thank you for sharing. I miss the piggies. They are so much fun. They were the cleanest critters we had. We never did get to breed them, just raised a few for the freezer. I did not watch the horror clip of factory pigs. I have seen it. Looking for a local farmer now that we moved into the city. I don’t know a pig Jackie and I think I need to change that!